Features Graniteware's speckled porcelain-on-steel that is lightweight, durable, stain, acid, and odor resistant and easy to clean. Includes wire rack with handles. Measurements are given in LxWxH. Please note: Not for use on glass, flat top or ceramic cooktops. These canners are designed for water bath canning. They are not recommended for other uses. Cannot be used with 1/2 gallon jars. 11 1/2Qt. canner only holds half pint or pint jars. 11 1/2Qt. canner measures - 12.75 x 12.75 x 17"
21Qt. 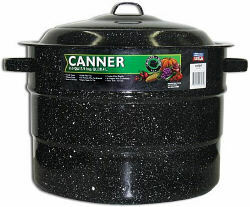 canner measures - 15.5 x 15.5 x 15"
33Qt. canner measures - 18.375 x 18.25 x 17.5"